We are pleased to be teaming up with Comedy for a Cause again for a night of fun, frivolity & laughter. It was a great night last year & after all the positive feedback we decided to do it again. 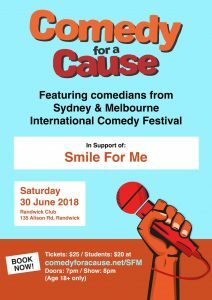 We will hold the event at the Randwick Club on the 30th of June. So get a crew of your friends together & come & join us. Tickets can be purchased through Comedy for a Cause (see link below) or be bought on the night if not sold out prior. Doors will open at 7pm for an 8pm start. Tickets are $25 for adults & $20 for students. The line up will be announced soon.